For months they were the faces on playing cards. Then they were captured or surrendered and disappeared into U.S. custody. One is a top diplomat, another a top spy. "Chemical Ali" makes the list. Saddam Hussein himself is there, as are two of his relatives. 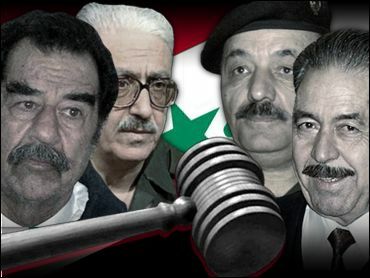 Regardless of their fame or obscurity, on Tuesday they became the accused — named in arrest warrants sworn out by the newly installed sovereign Iraqi government. They will be the first to face justice from a Special Tribunal erected to probe Iraq's past. The warrants were announced just after interim Prime Minister Iyad Allawi said that Saddam will be transferred to the legal custody of the Iraqi government on Wednesday. Because of security concerns, he will remain in the physical possession of U.S. forces. But Allawi insisted that Saddam must receive a "just trial, a fair trial." Allawi said that more than 1 million Iraqis are missing as a result of events that occurred during the former regime. That figure is more than twice the 400,000 people whom British Prime Minister Tony Blair has said ended up in mass graves. Ali Hasan al-Majid, also known as Chemical Ali for his role in chemical weapons attacks against the Kurds. Tariq Aziz, former deputy prime minister and foreign minister, Iraq's public face during most the past decade. Taha Yassin Ramadan, an Iraqi vice president and a revolutionary command council member under Saddam. Barzan Ibrahim al-Hassan al-Tikriti, a presidential adviser and Saddam's half brother. He was allegedly the chief organizer of a clandestine group of companies and funds handling Saddam's money. Watban Ibrahim al-Hasan al-Tikriti, presidential adviser and Saddam's half brother. Kamal Mustafa Abdullah al-Tikriti, secretary of the Republican Guard and Saddam's son-in-law. Sabir Abdul Aziz Al-Douri, governor of Baghdad and head of military intelligence during the 1991 Gulf War. Muhammed Hamza al-Zubaydi, retired revolutionary command council member under Saddam and a leader of the 1991 suppression of the Shiite rebellion. Abid Hamid Mahmoud al-Tikriti, presidential secretary who oversaw Saddam's personal security force. Sultan Hashim Ahmad, Saddam's defense minister. Aziz Saleh al-Numan, former Baath Party Baghdad regional command chairman. Jacques Verges, an 80-year-old French lawyer, has also agreed to defend Saddam. He has promised to put the spotlight on the United States for its years of support of Saddam, and to call such witnesses as Defense Secretary Donald Rumsfeld. The need to transfer legal custody but not physical control creates a delicate diplomatic situation, reports CBS News Anchor Dan Rather. National Security Adviser Mouwafak al-Rubaie tells him that in the transfer of custody, two U.S. soldiers will take the handcuffed former dictator from his cell and give him over to four Iraqi policemen. Saddam will then stand uncuffed in front of a judge. Saddam will be read his rights and the arrest warrant against him, then chained again and marched back to a cell. Allawi promised an open proceeding when Saddam faces war crimes charges, including genocide.